Kelly's rustic woodland baby nursery ideas are so cozy and warm that they are sure to inspire you to design a room using her pictures for inspiration. There are crafts projects, helpful fabric selection tips for a crib quilt and encouragement for those of you that are considering sewing your own fitted crib sheet and baby bedding sets. Kelly and her mom prove beyond a doubt that it is possible to make your own baby bedding and nursery decor. These ladies put their heads, crafts and sewing skills together to personalize the room and make it truly one of a kind. Jack's dad and grandfather also deserve credit for the creation and design of one of my favorite features of the room, the reclaimed barn wood wall. 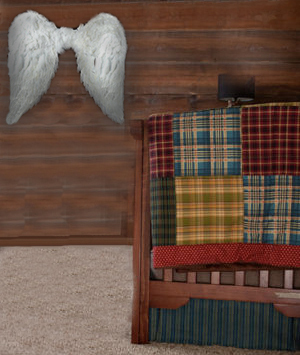 Go here to see angel wings in all sizes to use as photo props or nursery wall décor. This nursery could easily be transitioned into a nursery for a baby girl. Simply remove the wall décor and replace it with a pair of angel's wings. 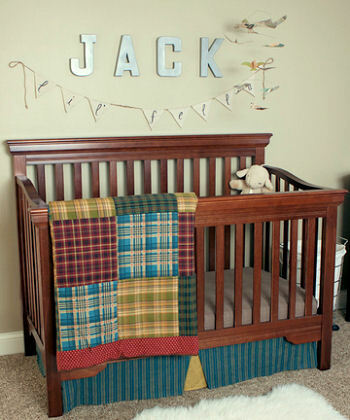 In the background of this nursery picture you will see the wooden wall that Jack's dad and grandfather built. After learning that someone was going to tear down an old barn they went out to salvage one side of the barn, cleaned the wood, varnished it and created a stunning focal point in this baby boy's nursery. The wall letters that spell out the baby's name were bought at Hobby Lobby and spray-painted silver. The "lil fella" banner was made by Jack's grandmother. She made it and hand-lettered it to decorate Kelly's baby shower venue. The bird crib mobile is also handmade. Jack's Aunt Hannah found the deer antlers and she and Kelly spray-painted them white. 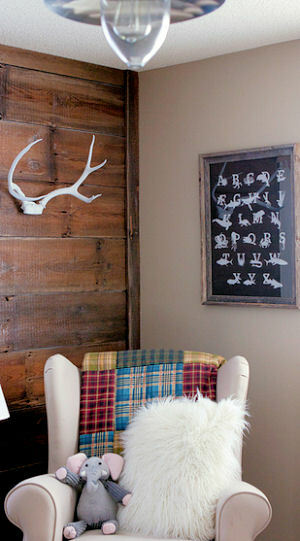 The alphabet print was bought from an online resource and the frame came from Hobby Lobby. The nightstand is another excellent homemade piece created by the baby's grandfather. The lamp and clock came from Ikea as well as the industrial nursery ceiling light. 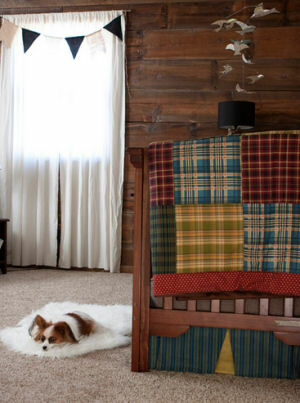 The crib quilt is made from a fabrics in a variety of colors and patterns. The blocks feature fabrics in blue, green and navy blue plaid and stripes, green plaid, red plaid and a solid red fabric for the border. The quilt is lined with a soft, brown fleece fabric. 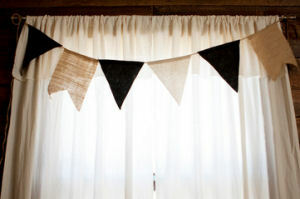 The nursery curtains were homemade using the muslin tablecloths from Kelly's baby shower. The bunting banners that were made by her mom and sister were also decorations from her shower. Kelly says that this will be Jack's room as long as they are in this house. We, here at Unique Baby Gear Ideas, believe that this design will transition well since it is a nursery for a baby boy that has features that can easily grow with him for many years.